Would you like to be able to draw? People often think that being able to draw is only possible if you have talent. However, that is not true. In this 5-day Drawing on the Right Side of the Brain® workshop developed by Dr Betty Edwards, you will learn the skill of drawing. You can learn the five perceptual skills that make up the skill of drawing in a 5-day Drawing on Right Side of the Brain® workshop held in central London or in North Wales. Whether you are a complete beginner or want to develop existing skills further the 5-day Drawing on the Right Side of the Brain® workshop teaches so much more than learning to draw (though we do that too). Registration is now open for 2019 course at venues in London and north Wales. "I am so happy to look at what I see in the world and know that I can draw it... Or at least make an attempt. It’s wonderful - thank you so much for facilitating that opening in my life. I am acutely aware that practise is REALLY important, so have been making sure I draw something every day - it’s so enjoyable, and I get those times when as you say “it just ‘happens’! !” ... I look at the end result a little bemused at how it happened, but there is the proof before me!.” Flora F.
Dr. Betty Edwards' Drawing on the Right Side of the Brain® 5-day intensive course is a proven technique for teaching drawing - particularly to those people who swear they could never be taught to draw! 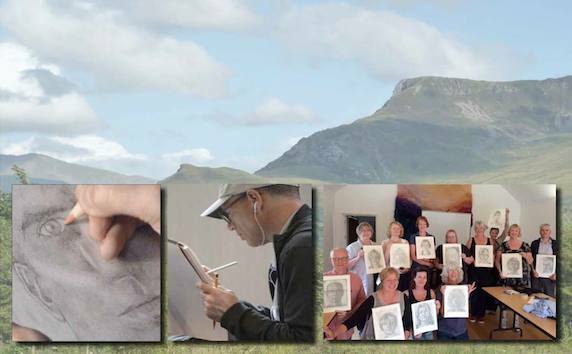 This course is taught in the UK by Anna Black, certified and licensed by Drawing on the Right Side of the Brain® Inc.
Anna teaches in the UK in central London (Little Venice), non-residential, and North Wales, near Bangor, (residential). The course lasts for 5 days (9.30am-5.30pm) and includes 35 hours of teaching and The Drawing Portfolio (RRP over £55 exc dvd). The cost for the course and all materials is £525. There is an additional charge for board and accommodation on the residential courses and you can purchase the dvd separately. Save £50 off the course fee by booking before the early bird expires. See individual course dates. The contents of the Drawing Portfolio were designed by Dr Betty Edwards and Brian Bomeisler. It includes all the materials you will need for the course, including drawing tools unique to Drawing on the Right Side of the Brain®. These unique tools were developed by Brian Bomeisler based on those used by the Old Masters. The Portfolio and its contents are yours to take home and keep. Please feel free to forward this newsletter to anyone who you think might be interested. There is a link at the bottom of the page where they can subscribe. We all hate spam and I will never sell your details on to any third party. If you'd rather not hear from me there is an unsubscribe link at the bottom of this email.